From the Glider Rocker to the Finish Line: Well, I DID IT! And, honestly, I have to keep reminding myself I did it and that was the point of this whole exercise. 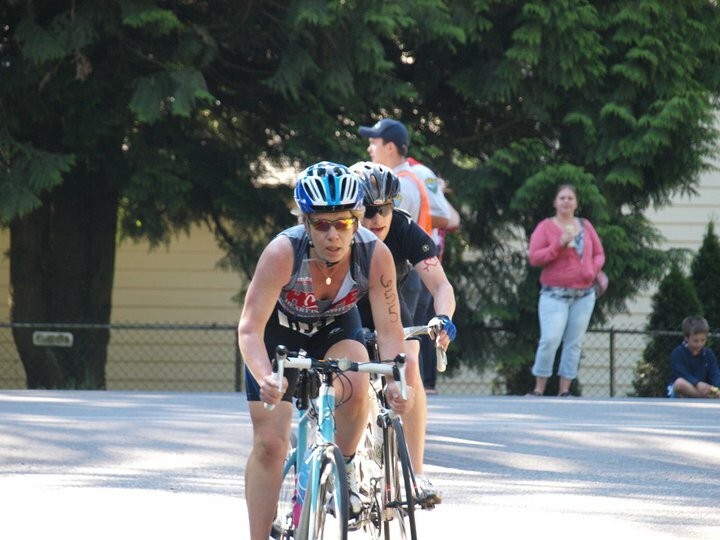 I have to remind myself that I completed the bike/run and I only registered for this to get out there, finish, and experience race conditions before adding the swim. I MUST KEEP REMINDING MYSELF! Bike: This is supposed to be my no brainer. Well, maybe I should have realized that it wasn't exactly a no brainer when, several days before the race, I began to freak out about the bike. I was very conservative on the bike, taking turns too slowly, being apprehensive on the pass (it was an open course, meaning cars and trucks on the course). That left turn I was so worried about? Piece of cake, really. At least the first loop was a piece of cake. I wish I had taken it harder and saved precious seconds. It was a fairly easy ride, some moderate rolling hills, some definite potholes. The potholes were significant enough that the race organizers marked them! I started off a bit slow (and on the wrong side of the bike out, but thankfully no one was headed in at that time) and was really slowed by my cages on my bike - I truly need to get to clipless pedals by my August race, I just don't want to do my first fall (everyone falls at least once) on race day so I keep putting it off. A few minutes into my ride, I really started to feel comfortable and was on a straightaway so I began to hit the speed. I was passing people quickly, and with little effort. Then, as it got more hilly, I realized how conservative I was. I would pass people effortlessly on the way up, only to have them pass me on the way down! WHAT???? Obviously, I was too conservative when I should have been letting it fly - I did get better at this, but it took some time. After about 2/3 of the first loop (it was two 7 mile loops) I settled in to a pace (in hindsight too slow of a pace) and seemed to have found my spot in the group. Then, we headed back onto a main road which, from my previous drive of the course, meant I should be able to power this pretty good, so off I went. I began passing people, aware that there would be a hill in my future. From my recollection, just a normal hill, no big deal. As I approached the hill, I gained speed and kept powering through. In the initial incline, powering through and then "WHAM" it hit me - I should have downshifted several hundred yards ago because this was WAY steeper than I had thought it would be and my quads were screaming. Unfortunately, that basically threw the whole hill for me - it was impossible to regain the momentum as I downshifted over and over with the hopes I would make it to the crest without *GASP* getting off my bike and walking! This hill wasn't straight up, but it was steeper than I thought and it WENT. ON. FOREVER. So after powering through the hill (and I didn't have to stop!) I descended to the beginning of the course to start my second loop. I thought to myself "ok, you navigated it fine, now put on more speed." Off I went, make the quick right to the "left turn" and in front of me is a tow truck going SLOOOOOOW. Held up by a bunch of riders ahead, the tow truck proceeded slowly with his right turn signal on the whole time. I wanted to pass him on the right, but was too concerned he would turn without me seeing him. I was going insane! Every time he passed a side street I would groan louder and louder each time he didn't turn. After a minute or so I was yelling "turn, turn, turn!" This made all the race volunteers on the corners howl with laughter! Finally he turned and I shouted "Hooray!" followed my more howling laughter! I passed the group of cyclists that had been ahead of the truck and off I went. The remainder of the ride to the "big hill" was fairly uneventful. Then, at the slight descent leading to the hill I put on a ton of speed hoping to catch the momentum. As I began the hill I was flying, so happy I wasn't going to almost stall again. I began downshifting slowly to accommodate the incline and then "WHAM!" Downshifted to fast and my legs were spinning without resistance. DAMN! There went all my momentum AGAIN! I struggled again to reach the crest. Finally, I turned into the bike dismount area only to have my husband screaming "KEEP GOING!" He was annoyed I slowed down to early - but I was concerned about my cages catching (again, I REALLY need to get those clipless pedals on!). I did walk a bit through the brick part as my quads were really having a hard time adjusting and it was impacting that glute pain I warned my body about! But, it did work itself through way before the midpoint and I continued from there with few issues other than it actually was WAY warmer than I expected! As I re-entered the park I found a great burst of energy and finished strong. So, I finished. I was NOT happy with my bike time and I start working on that Wednesday at my team training. My run I was ok with, and hope to get faster the next time around. 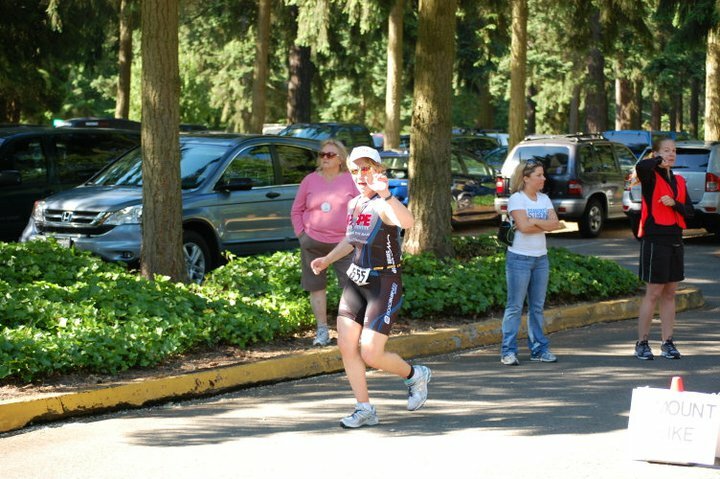 In less than two weeks I will be doing another Tri - I have to admit, I can't wait. But, I am getting cold feet on the 1/2 mile swim, so I "downgraded" to a Try a Tri at this event to limit my swim to 1/4 mile. Of course, as soon as I did that I had a great swim on Wednesday night. So much of this is a mental game, and once the pressure was off I enjoyed my open water swim tremendously! But, the upcoming race is on a wholly unfamiliar out of town course for me that will be in hot temperatures but COLD water, so I am thinking it will be best to ease into it. 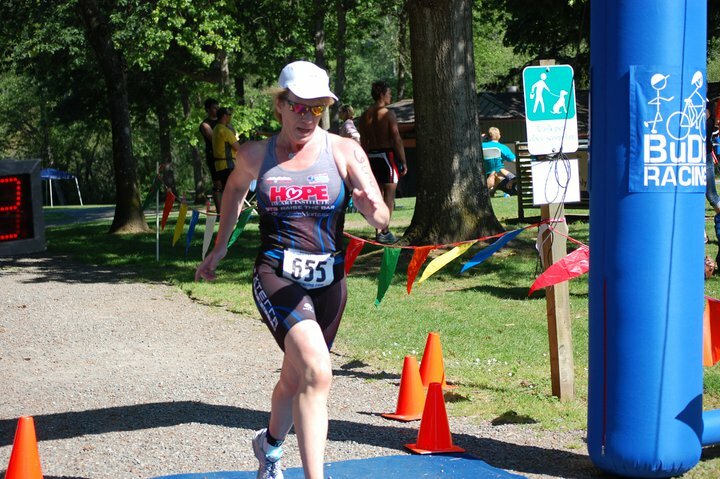 I will probably regret not doing the full half mile swim, but I will get that opportunity on my home course in early August for a swim race prior to the Sprint there in late August. In all honesty, this has all been kind of anticlimactic. For some reason I have been kind of in a funk about it. Maybe it is the slow time. Maybe it was that I recovered fairly quickly and don't feel I gave it may all. Maybe it just IS. But, it is time to move on to the next race and training the bike and swim!